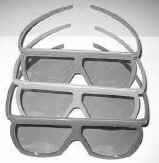 3d glasses for Super Bowl 3D Commercials, and "Chuck" Episode (Color Code) These are the only glasses that will work for the 2009 Super bowl Commercials and Chuck! We have the world's largest variety of 3D glasses! Works with 3-D material in ColorCode 3-D format on all modern displays and projectors. These are the only type of 3D Glasses that will work for the Super Bowl commercials and Chuck superbowl commercials that were done in 2009 these are not for the 2010 superbowl! These glasses are for the new Coraline, Journey to the Center of the Earth and My Bloody Valentine DVD. These are the only glasses that will work with these DVDs. The Magenta goes on the right eye. There are no plastic glasses available for this feature. These durable glasses contain optical quality cast acrylic lenses tinted to exacting color standards. The lenses are chromatically tuned to phosphors in computer screens to virtually eliminate ghost images and other annoying visual distortions. The frames fit over most regular frames with corrective lenses. ATTN: These are the Best Glasses to see Thrillville, Shark Boy and Lava Girl at the theatre and Michael Jackson 2010 Emmy performance, "The Medium" on TV NBC. 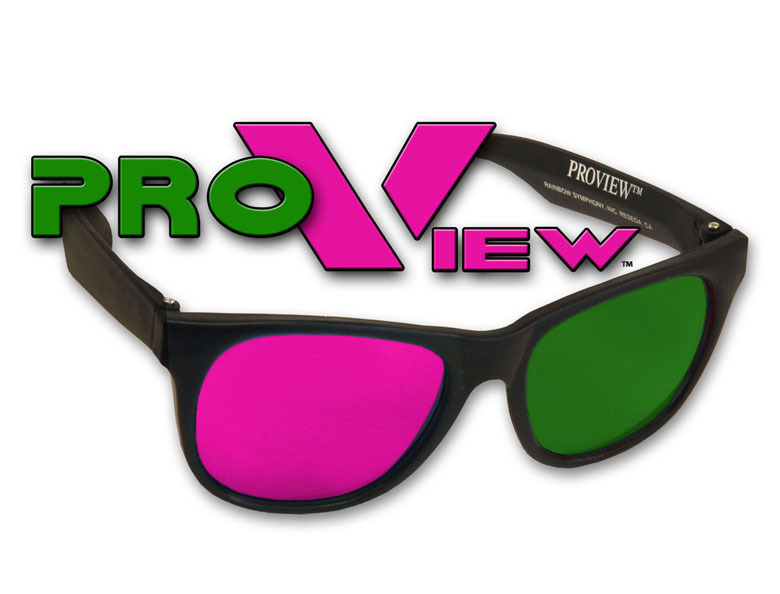 Don't settle for the glasses they give you, Get our Proview plastic 3D glasses and be the envy of everyone else at the theatre! Graphic Designers - Produce dynamic 3-D logos, advertisements and promotions using popular Photo Editing, Drawing, Paint and 3-D Modeling software. Game Developers and Software Programmers - Add anaglyph 3-D for enhanced realism. Shift planes of visual information forward and backward to create extraordinary depth. Scientists and Researchers - View your data in a dramatically more realistic fashion everything from simulations and medical imaging to CAD and molecular modeling. Same as above but specifically for Magenta Green anaglyph applications. These include DVD versions of Coraline, Journey to the Center of the Earth, My Bloody Valentine, Monsters vs. Aliens and the 3 Stooges. 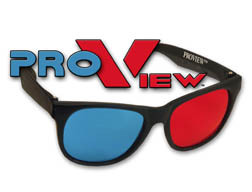 Pro-X Professional Anaglyph 3D Glasses, same lenses as Proview, our more contemporary style for gamers and the like. Optical quality, cast acrylic lenses tinted to exacting color standards. Virtually eliminates ghost images and other annoying visual distortions. Lenses are a hybrid color cross between blue and cyan. 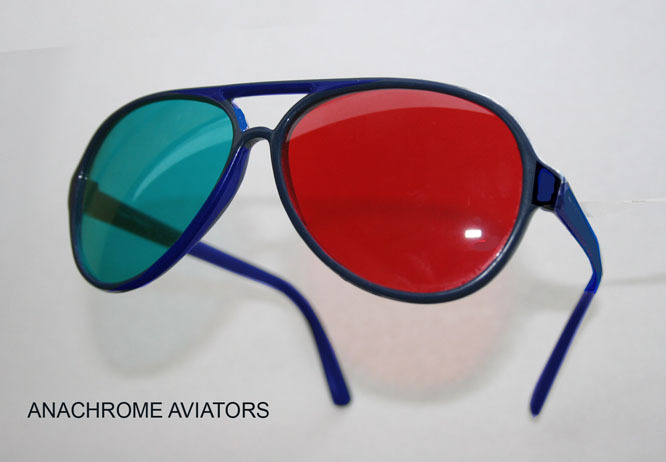 These are anaglyph glasses that are similar to our Anachrome glasses below. However they have no diopter so they can be used for far away viewing at the movie theatre and close up viewing alike. They are red/cyan and slightly smaller than the other glasses listed below. They still fit over most glasses. Great for video projection for classrooms. AnaChrome glasses perfect for Spy Kids 3D DVD. These glasses (also called and labeled PrismaChrome) are similar to the MiraChrome with one essential difference. They have much less of a dioptor adjustment so they can be used for more distant viewing options such as TV, poster and movie viewing. They only have a slight dioptor in the red eye to correct for color shift. These are suitable for up to 20' away. 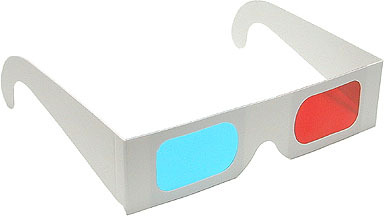 Therefore, they are perfect for viewing anaglyph (red/blue) DVDs such as SPY Kids 3D!! These have 30% larger lenses than the Anachrome glasses to fit over larger prescription glasses. The lenses are the same colors as the Anachrome anaglyph glasses. If you want to sample all our professional grade anaglyph glasses this is the most economic way. Includes 1 ProView, 1 Anachrome Everything and 1 AnaChrome pair of anaglyph glasses. Save ~$3! Same high quality as above in a clip-on format. 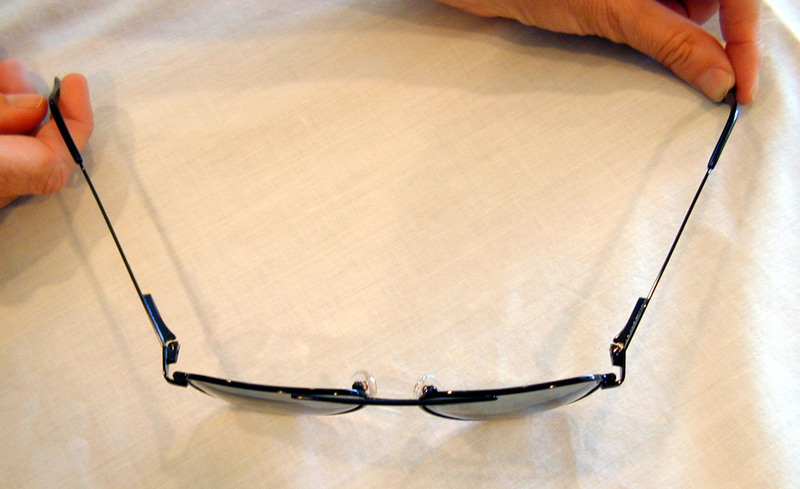 Prevent your glasses from getting dirty from putting them on top of your head when not in use. The blue side is a good compromise of blue and cyan. It's a whole new dimension when you add virtual reality to your web site. These glasses are an affordable visual enhancement to the cyber world. Surf the net...develop your own 3-D images...explore new depth defying worlds. Same as above but with Cyan filters instead of blue. Preferred by some 3D experts. 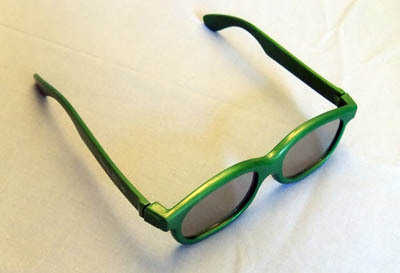 These are the best cardboard glasses for watching 3D anaglyph DVDs such as Shark Boy and Lava Girl and for watching 3D TV specials such as "the Medium". Handy Tip- Need glasses same day? Try your local comic book store. They may carry 3D comics with glasses enclosed. Same as above but with Green filters instead of blue. This is used for some print stereo books and some European 3D products. Similar to above without temples. Perfect for direct mail campaigns, binding into publications and for in-pack and on-pack promotions. Even smaller than our anaglyph cards these are for use when space is a premium. Suitable for insertion in CD case. These are all linear polarized unless otherwise noted. 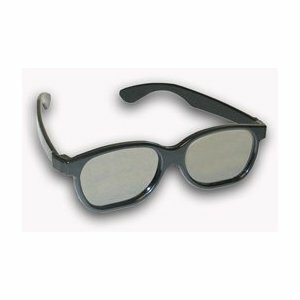 Linear polarized 3D glasses will work with all the old stereo projectors, StereoJet prints, and modern projector systems with linear polarizers attached. Circular polarized 3D glasses are specifically for the StereoGraphics Z-Screen and some 3-D digital projection systems. If in doubt check your owner's manual. 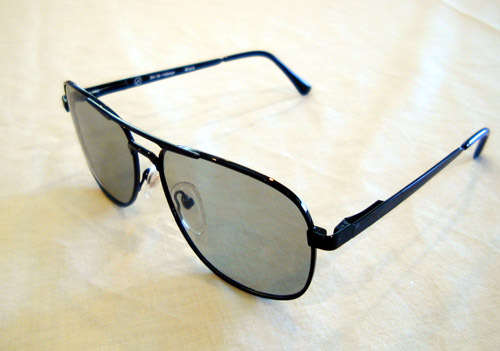 Polarized lenses specially cut at opposing 45� degree angles. For viewing stereo pairs projected through left and right polarizing filters. Works on all but the Fed projectors. Heavy duty plastic polarized plastic. Perfect for 3D viewing of projected stereo movies or images. Fits over even the most bulky glasses. 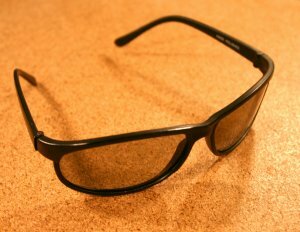 Polarized lenses specially cut at opposing 45� degree angles. For viewing stereo pairs projected through left and right polarizing filters. These are used in Imax theatres and most stereo applications. For Real D Cinemas please use our circular polarized glasses. For other orientations please contact us. Similar to the above theme park glasses but larger for total immersion such as for viewing Imax projection. Also for fitting over very large glasses (Elton John may have to use these). These are linear polarized. These glasses look like the Real D glasses used in cinema's throughout the world but instead of being circular polarized are linear at 45/135 orientation. For circular polarized RealD glasses click here. These stylish polarized glasses have Polarized lenses specially cut at opposing 45� degree angles. The lenses are molded and of better quality than the theme park Style. They have folding temples for easy storage. For viewing stereo pairs projected through left and right polarizing filters. These work with all the older stereo projectors from the 1950s (TDC, Triad...) and twin stereo projectors fitted with our polarized filters. Also available in circular (see below). These patented glasses will convert Real D 3D programming to 2D at the theatre. This is useful if a studio has done a particularly bad conversion of 2D into 3D (i.e. Clash of the Titans) or due to an eye disorder or another reason you cannot view 3D. It will allow someone who does not enjoy 3D to watch a movie with people who are watching a 3D movie. I'll be back... with these new "terminator" wrap-around style 3D glasses. These have high style and tell people you are serious about your 3D! Limited quantities are available. Unlike our other 3D glasses these do not fit easily over prescription glasses. 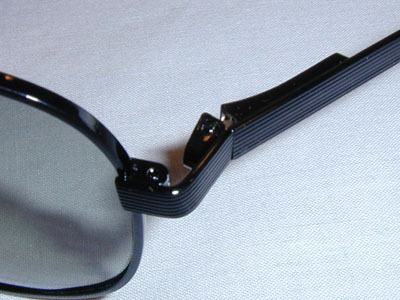 These are the terminator glasses above except the linear polarizers are in 0/90 orientation not 45/135. Most newer Imax 3D Theatres use this orientation but you my want to check with the specific theatre before ordering. Many theatres still use 45/135 (standard linear polarized glasses) especially in Europe. 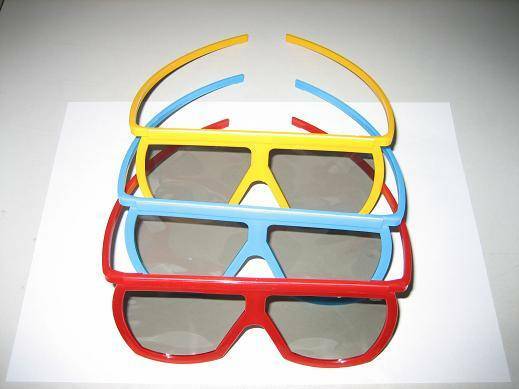 These are the Rolls Royce of 3D glasses. Spring clips to prevent breakage and metal appointments make these last very long. Same high quality as above in a clip-on format. Prevent your glasses from getting dirty from putting them on top of your head when not in use. For viewing stereo pairs projected through left and right polarizing filters. These are linear. For RealD circular see below. Our 4 inch square glass filters are high quality custom made glass 45 degree, -45 degree paired polarizing filters. They are 5mm thick and have a special anti-reflective coating. They are specially matched for use in stereo projection. Our 6 inch square glass filters are also specially matched 45 degree, -45 degree paired polarizing filters. They are a great choice for the larger Barco projectors and other high-output units. They are 5mm thick and have a special anti-reflective coating. We decided to offer the most niche product ever! This product will help detect the direction of a the linear component of polarized material. Put it on a projection filter or glasses and slowly rotate. The axis orientation is indicated when it becomes its darkest. This is great when trying to detect the orientation of polarized filters and polarized glasses. Actual size is 4 inches long. For use with circular polarized material it is useful for determining the linear component. NEW See our 3D Filter Holders! Extends the life of your 3D Polarized Filters! This is only for applications that a circular polarized glasses are needed. Specifically for applications such as StereoGraphics Z-screen and Real D theatres. These glasses have steel frames and nose pads for extra durability. This is only for applications that a circular polarized glasses are needed. Specifically for applications such as StereoGraphics Z-screen and Real D theatres. Prevent your glasses from getting dirty from putting them on top of your head when not in use. Heavy duty plastic polarized plastic. Perfect for 3D viewing of projected stereo movies or images. Fits over even the most bulky glasses. This is only for applications that a circular polarized glasses are needed. Specifically for applications such as StereoGraphics Z-screen and Real D theatres. These are identical to the glasses you get in the Real D theatres. They are circularly polarized and work with our circularly polarized filters. I'll be back... with these new "terminator" wrap-around style 3D glasses. These have high style and tell people you are serious about your 3D! Limited quantities are available. Unlike our other 3D glasses these do not fit easily over prescription glasses. This is only for applications that a circular polarized glasses are needed. Specifically for applications such as StereoGraphics Z-screen and Real D theatres (such as for Avatar in Real D- not Imax screens) and those using our circular polarizer sheets. These circular polarized glasses are specially designed to reduce ghosting on Zalman 3D Monitors. 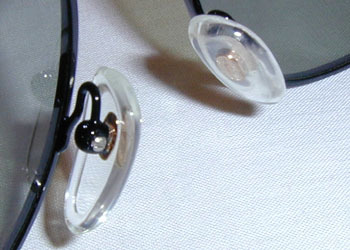 These have hard plastic lenses which are of much higher quality than the glasses supplied with the monitor by Zalman or the 3D laptop computer with a 3D Display Acer. These glasses are not for Real D applications or applications using our circular polarizers. Circularly Polarized cardboard glasses. For when you have circularly polarized applications at a reasonable cost. Simulated 3D effect based on the phenomenon of dark and clear lenses. The image through the dark lens reaches the brain slightly later than the image through the clear lens, creating the illusion of 3D. It works with objects or scenes moving horizontally across the field of view. The Pulfrich method of 3-D is used for TV, video and computer screens. Although it is not authentic 3D it gives the illusion of depth and can be fun to use when watching sporting events and videos which are specially made to take advantage of the effect. The Ultimate 3D glasses also can be used as Pulfrich glasses. Also known as C3D and Holoplay glasses these achieve a 3D effect through the layering of different colors. The ChromaDepth� glasses create striking 3D images from normal 2D images by pulling forward the color red to the foreground and sorting the remaining colors according to their position in the rainbow. There are two types of lenses available: Standard ChromaDepth� 3-D and High Definition (HD) ChromaDepth� 3-D. Standard lenses are recommended for use with printed images, books, magazines and brochures, while High Definition lenses are suggested for viewing computer graphics, video, TV, film or distance viewing applications. These are the glasses used for the "I love the 80's! 3D programs on VH-1! They are also available with hard plastic frames. These are good for heavy duty applications and in gallery exhibits. This viewer can be used for viewing stereo pairs on a computer screen as well as for viewing stereo cards. It is prismatic, made of a high quality plastic and can be used to view the reproduction Holmes cards, and the images in some of the books that we offer (Back to Basics and the Civil War in Depth). It collapses and folds flat for easy mailing. It also has a foldable head piece that helps to keep it orientated properly on the head. 2 cardboard anaglyph glasses, 2 pulfrich glasses and one Stereo Card viewer. A great aid in viewing stereo images as you surf the web. One pair anaglyph ProView glasses, 2 cardboard anaglyph glasses, 2 pulfrich glasses and one Stereo Card viewer. Surf the web for 3D images in style. To find some pages that offer stereo images visit our links page 'images' section.